The GOP is dying a slow, necessary death. Any organization that completely and consistently backtracks on its mission statement and core principles is little more than an empty shell of self-serving powermongers anxious to extract whatever last bit of personal gain they can before its dissolution. Like a small crack in a windshield that progressively worsens and ultimately spiderwebs, the Republican Party is headed for destruction. The election of Michael Steele, former Maryland lieutenant governor, as Chairman of the party (after six rounds of voting) does not bode well for the future of Republicans. Casting himself as a “big tent” Republican, Steele seems to hope that the memory hole will work in his favor (as it usually does in politics). After the May GOP presidential debate in South Carolina, Steele appeared on FOX to deride and dismiss Ron Paul and his ideas, saying that “for me, it’s done” (Notable segments at 2:50 and 4:30). This despite the fact that Ron Paul had been winning the FOX-sponsored poll all night long—a clear indication that despite the disgust of Hannity and his cohorts, the “common folk” responding to the poll were pleased with Paul’s ideas. 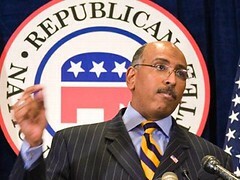 Michael Steele does not need to adopt Ron Paul’s platform, nor does the Republican party as a whole. But when a group of high-ranking politicians claim to adhere to a certain set of principles and then spurn the one individual who best represents those standards, they show their true colors as hypocritical opportunists. It’s time that the Republican party amended their platform to flat out disclose what they believe in: an ever-expanding world empire; rendition, torture, and the denial of Habeas Corpus to “enemy combatants”; the repeal of the fourth amendment; deficit spending; bailing out companies that are “too big to fail”; inflationary fiat money creation through a central banking system; nation building; preemptive warfare fueled by lies and propaganda; federal programs not authorized by the Constitution; and, encapsulating the rest, big government. Ever-concerned about the “base”, though, the Grand Ol’ Party will not publicly reject the principles popularly supported by the proles. Thus, their only palatable option is to witness the demise of an institution that permits its leaders to circumvent its stated ideals time and time again, without public repudiation or recognition. Michael Steele may want a big tent in the Republican Party, but a tent full of hot air and hypocrisy does not make for a good political movement. Wow, Connor, after reading that Wikipedia article on Proles, I’m gonna add 1984 to my “to-read” shelf in GoodReads. Thanks for the hat tip. I’ve never heard Michael Steele say he was a “big tent” Republican. I’ve never heard him even infer that. In fact he agree’s and has stated such with Reagan that he isn’t about “pale pastels” but is about actual conservatism and not psuedo conservatism. I can’t believe that you took a texting poll to show that your candidate was superior to every other. It shows one of two things that: One, Ron Paul supporters are more local and proactive. Two, Ron Paul supporters have more time on their hands. I would do with the former having read some of your blogs but in my opinion your point is weak and you used it only to make your belittling of Michael Steele more palatable. As for you bash against the Republican party of late I disagree with a few of them but on the whole you are right and I’d be crazy to try and defend them. Having read the majority of your recent posts with all the controversy out there over Obama’s early Executive Orders, Cabinet appontments, and stimulus bill why do you only go after Republicans? Are you trying to convert them or what? There a lot more important things going on right now than to devote a post bashing the new Chairman of the GOP. I’ve never heard Michael Steele say he was a “big tent” Republican. His answer to this question epitomizes the big tent policy. …is about actual conservatism and not psuedo conservatism. And the meaning of this statement depends entirely upon which version of conservatism you actually adhere to. Conservatism has become so misapplied as to render itself void of any meaning. I can’t believe that you took a texting poll to show that your candidate was superior to every other. You misread my words if this is what you believe I said. Note that what I did say was that Steele and the FOX pundits were disregarding their own poll and the people responding to it—not a statistically accurate random sampling of the entire electorate. But in reference to the principles of the Republican party, then yes, Ron Paul was and is superior to every other. It’s a simple matter of fact demonstrated by a long, principled voting record and set of core values that all his opponents lacked. …why do you only go after Republicans? Umm, out of the last five political blog posts, three were about democrats. There a lot more important things going on right now than to devote a post bashing the new Chairman of the GOP. I’m not bashing the Chairman. I’m simply using him as one more reason why the Republicans as a whole are doomed. This is not to say that the Democrats are any better—they certainly aren’t. But at least most of them are willing to admit that they stand for the common principles they do advocate (though they won’t label them as what they really are, viz., socialism, un-Constitutional, theft, etc.). All I’m saying here is that the card-carrying Republicans in power are a bunch of hypocrites and deserve the defeat they’ve been handed, the eventual dissolution of their party. The disconnect between GOP power brokers and the actual conservative base is no worse than it has been for most of the last century, except for a brief respite when Reagan dragged many reluctant bigwigs along. They soon wrested the party while maintaining a facade of Reagan conservatism. It is important to realize that the GOP consists of far more than social conservatives. Many social conservatives are far from being fiscal conservatives and vice versa. There are also defense hawks and libertarians. There is some overlap between these groups, but the GOP is actually made up of people with quite diverse political ideals. People that study the demographics of the GOP can tell you that it can only compete when both social conservatives and fiscal conservatives unite. Sadly, for those of us that are more libertarian minded, the party could successfully compete without us and the defense hawks if the other two groups can agree. You state that the GOP cannot survive. You may be correct, but I respectfully disagree. I believe the party can and will survive. It’s been in much worse straits before and come around. The party is down, but not out. Michael Steele is proud of the fact that he was the most moderate candidate for the GOP chair. The fact that he won after six rounds hardly means that he has a mandate to apply his moderate views. He won because at least some people think he can be an effective fundraiser and can field competitive candidates in target districts. As far as ideology goes, his elevation to this position demonstrates a deep ambivalence among Republicans. While I have long been a registered Republican, I have been strongly toying with the idea of registering as an independent, simply because I find myself at seemingly irreconcilable odds with the party’s direction. This would seem to validate your thesis. But my objective view of the matter leads me to believe that the party will survive just fine without the likes of me. The only thing that has kept me from leaving the party has been the fact that I actually do work on the local level to influence the candidates that end up on the ballot. Maybe it’s worth remaining a registered Republican to continue to have that opportunity. I’m seriously going to start a PAC to fundraise the dough to send every reactionary and paranoid “conservative” out there who calls the Democratic Party ideals socialism an actual book on socialism, so that you can better understand what it actually is, and stop using the word wrong. Probably have to do the same with un-constitutional. And as for “theft”? Well, how reasonable and productive of you. Steele himself cannot believe this (unless he himself is an idiot) but he is trying to parlay it to the American people to score cheap political points. And this is just from a quick google search for just today… go back to the campaign, it gets worse. The Democrats are not above this, by any means, but right now, the GOP seems to have lost all ability to make an argument without resorting to some of the same childish (and also intellectually dishonest) as your own use of the words “socialism, un-constitutional, theft” at the end of this very post. Voters are not this gullible. It’s like a person shopping for a car. On one side of the road you have a guy telling you he’s offering a good car for a fair price, and though he can’t prove it, you should put some faith in his honesty, give him a chance. On the other side, you have a guy with messed up hair in a food stained shirt screaming “Terrorists (and socialists!) will eat our babies if you don’t buy this car!” And the car he’s selling is a 1982 Datsun B-210. For $10 G’s. That guy would be better off finding better product to sell, and toning down the paranoid rants and irrational (and fact challenged) marketing. So far, the GOP continues to sell us trash, and the best argument they can make is calling everyone a socialist, reminding us of the war on terror, and suddenly remembering a federal deficit that they created themselves. The hubris is unbelievable. The lack of logic is unforgiveable. I guess I haven’t read the last few blogs because they didn’t have any titles that “spoke to me.” As for the video I see why you think that but to understand a person’s views you need to examine the record not a single statement. See 2:20 and on for the applicable content. It’s kind of a nit pick thing but I just wanted to see what your motives were. Again I agree in large part about your criticisms of the GOP but as you well know disagree with you on most of War on Terror policies but I won’t change the topic of this thread. I’m seriously going to start a PAC to fundraise the dough to send every reactionary and paranoid “conservative” out there who calls the Democratic Party ideals socialism an actual book on socialism, so that you can better understand what it actually is, and stop using the word wrong. I’d love to hear any logic-based, compelling argument that shows how the economic policies of the Democratic Party are not socialistic. I fully understand what the word entails, and any attempt to tax one group of citizens to economically benefit another is socialism, plain and simple. As I’ve said many times before, the Republicans are just as bad in their socialist redistribution of wealth, but it’s the Democrats who flat out champion the welfare state as a utopian ideal. As for the video I see why you think that but to understand a person’s views you need to examine the record not a single statement. To look at a person’s character, I believe it’s advisable to disregard pretty much anything they say when they’re running for office unless it consistently matches up with the person’s previous actions and statements. Giving a TV interview during his campaign and upon his election hardly shows who Steele is and what he truly believes. That said, the man very well may have changed his tune and sincerely believes in traditional conservative principles. But that’s easy to do when your president isn’t in your party and you rise to fill the “loyal opposition” seat. Republicans prostituted themselves during the Bush administration, and now all of a sudden they’re taking the moral high ground when Obama is pursuing many of the same policies that Bush did? Please. That’s my point exactly! Everything I know about Michael Steele which admittedly isn’t a ton is consistent with my conservative values of a strong national defense, fiscal responsibility, and small government. I have my finger crossed that it is out of finding their conservative values again and not out of some kind of “loyal opposition” mantra. Both of these points will only be proven (hopefully) or disproven with time. I lived and worked in Washington D.C. during the 2004 election for the RNC as a TV studio intern (Yes, the RNC has a TV studio). Michale Steele was one of our frequent “talking heads” as he did interviews across the country promoting the ticket. I can’t say that I agree with all of his policies or positions but I do have to mention that there isn’t a nicer guy out there. We often had “political divas” come through the studio (ahem…Sen. Chuck Grassley) but Steele was always kind, gracious and made time to talk to the lowly intern. On a political level, I’m not sure he was the best choice but on a personal level, I have to admit that I’m happy for him. Best of luck Chairman Steele! Connor, I am simply asking that adults wanting to have a discussion that leads to progress or advances of understanding make a distinction between something with socialist characteristics (welfare programs, public schools, law enforcement, military funding, and GASP! the postal system — all of which rely on a redistribution of wealth) and actual subscription to the philosophy of socialism (which goes much further than the institutions I listed above). The word’s constant use (and abuse) by conservatives with nothing more constructive to ad to political disagreements has dumbed the dialog down so much, it’s now working against the Republican Party itself. McCain/Palin tried to run a presidential campaign with the same cheap tactics, and it was like watching a train wreck. You can find capitalist, socialist, marxist, and anarchist elements in various aspects of our republic… and the hybrid we’ve created between free market and regulatory management is the foundation of our economy, one of the most stable in the world (despite what we’re currently experiencing). The redistribution of wealth is a key part of our government, and always have been. Conservatives only notice it on certain inflamatory issues and when they are in the minority. Then it’s all they can prattle on about. And it’s childishly naive. That said, I came more to half agree/give input on what is holding the GOP back. I was merely distracted by the trumped up warning cries of “socialism” ending what was to that point a productive post. Ridiculous rhetoric meant only to inflame is a pet peeve of mine. As for the future of the Republican party, I stand by earlier comments and would ad that I hope they pull it back together and return some substance and principle for their reason to exist. 8 years from now, my Democrats will look just as bad if left unchallenged for that length of time. Social interventionism is an action which involves the intervention of a government or an organization in social affairs. Such policies can include provision of charity or social welfare as a means to alleviate social and economic problems of people facing financial difficulties; provision of health care; provision of education; provision of safety regulations for employment and products; delivery of food aid or recovery missions to regions or countries negatively affected by an event; adoption programs; etc. Benson was right (decades ago) when he said we have traveled far down that path. It has been a gradual process. Both parties are advancing the philosophy and we need to see it for what it is even when it’s one program at a time. …make a distinction between something with socialist characteristics … and actual subscription to the philosophy of socialism (which goes much further than the institutions I listed above). A tiny bit of socialism and the absolute espoused philosophy differ only in magnitude. Call it what you want to soften the blue, but the welfare state (supported by both parties) is at its very core based on the philosophy of socialism. McCain/Palin tried to run a presidential campaign with the same cheap tactics, and it was like watching a train wreck. Their train wrecked because (among other reasons), they failed to admit that their party (and their platform) was loaded with the same compromise of principles. Hypocrisy and disingenuousness are readily evidedent, and being unable to stand on a solid base of core values, they fell. And rightly so—as I said earlier, they (and the party) deserved to lose. …the hybrid we’ve created between free market and regulatory management is the foundation of our economy, one of the most stable in the world (despite what we’re currently experiencing). You’re really going to argue that a fiat monetary system based on fractional-reserve banking is stable? Stability exists in this system only so long as people have confidence in it. Regardless, stability shouldn’t be the ideal and goal of an economy, for that introduces all sorts of moral subjectivity—if you want stability, that opens the door for the government to intervene and provide “security and prosperity” for all to enjoy. Problem is, they are nowhere authorized to so intervene, and there lacks any strong moral argument for their economic intervention. Stability might be the result of a health economy, but it should not be its objective. The redistribution of wealth is a key part of our government, and always have been. Always has been? Go read a (decent) history book. The redistribution of wealth at the hands of government is a recent invention in American governance. And does antiquity beget morality? Should we continue to promote a system just because it’s been going on for a few decades? The government has been spying on its citizens for decades as well—should it continue to do so? Would you support your same argument had it been given by Southern slave holders 150 years ago? Conservatives only notice it on certain inflamatory issues and when they are in the minority. Then it’s all they can prattle on about. And it’s childishly naive. Wow, now there’s a false blanket statement. First, I would agree that most Republicans cry wolf when they’re in the minority; I said as much in an earlier comment. Second, as I said to Chris in comment #2, you have to define conservatism before referring to it. The word itself is devoid of meaning. And third, others like myself have been noticing it and calling it out on multiple issues of varying degree, and for the past several years as well. Your incorrect accusation of a similar nature on a recent post betrays your myopic brushing with broad strokes. Ridiculous rhetoric meant only to inflame is a pet peeve of mine. I don’t mean to inflame, only to assess. I stand by my socialism claim 100%. Again, I invite you to provide a reasoned argument against it; simply stating there is a difference does not make it so. Feel free to write a post on your blog and invite us over for comment. I think Jasonthe would refer to the postal system as socialistic, and thus claims that there have been elements of socialism in the republic since the beginning. If the postal system is at all socialistic, then he is right. I’m curious to hear your response to that. COMMUNISM: If you have two cows, you give them to the government and the government sells you some milk. SOCIALISM: If you have two cows, you give them to the goverenment and the govenrment gives you some milk. CAPITALISM: If you have two cows, you sell them and buy a bull. Then you sell the bull’s service. NEW DEALISM: If you have two cows, you shoot one, milk the other, and pour the milk down the drain. NAZISM: If you have two cows, you do with them what the furer tells you to. And you never let a Jew drink the milk. If the postal system is at all socialistic, then he is right. I’m curious to hear your response to that. I think we need to make sure we understand the definition of socialism. What I’m referring to, and what I believe is generally accepted as a proper definition, is the taxation of one people to directly and privately profit another. You don’t privately profit from a post office or a freeway. Instead, these are services funded by your taxes that are generally available to all for use. I could argue that these aren’t the proper role of government, but that’s beside the point here. I don’t think that they are socialism (though they might be labeled as a “social service”) since the benefit is general and universal, not private. Neither do individuals financially gain from these programs. It’s vaguely written (in the constitution) how much authority the gov should have over the postal service. What’s the word, “establish”? It has been interpreted differently over the years. Same with the states and education. There has been a gradual increase in authority over education. It’s all about degree. I agree with both Jason and Connor. The term “socialism” has been thrown around unnecessarily as a scare tactic, especially during the elections. At the same time, it is naive to believe that our nation is not gradually creeping toward more and more socialism, as Connor has defined it (I didn’t see a definition from Jason). So, I think it’s very appropriate to use the term “socialist” to describe many of the programs and proposals in our governments today, but we should be careful not to overuse the term or misapply it. Good discussion, guys. P.S. I better go get that chip in my windshield fixed; thanks for the reminder, Connor. To look at government this way, we must ask: Do I have a right to tell my neighbor that he makes too much money and therefore needs to give me some because I’m so poor? If not, then I cannot give power to a free government if I don’t have the power in the first place. Just governments derive their power from the governed. The second way to look at it is through a strict Constitutional authority basis. Under that authority, the federal government has the authority to run a post office and build roads. We’ve had discussions on that before as far as how far that power should extend and what uses . . . But the Constitution does not grant authority to redistribute wealth through force of government. Nor does it grant authority to pay for individual or universal health care. Such powers would be the province of the States if the state constitutions allow for such a thing. But none do. step 1: a few schools are publicly supplied through land grants, parents pay tuition for these and they’re locally operated and controlled. Majority of education done through private schools/tutors. step 2: Land Ordinance of 1785 established a reliable way to fund public schooling. Most schools still privately owned and operated. Notice the gradual shift from individual responsibility to government control over education? I would have been happy to see it stop at #3. Of course, Steele is mostly known for his losing Senate campaign based on political identity theft– he claimed to be a Democrat! Carborendum, I absolutely love that talk by Benson, and likewise Locke’s works such as social contracts. Just government absolutely derives its powers from the governed. Our current government is absolutely unjust. I don’t care if 90% of the people thought it would be a good idea to pay poor individuals out of taxes.It’s still unjust as you described. I have no power to tell my neighbor he makes too much and must give some up for the poor. Likewise I have no power to tell my neighbor he shouldn’t drink, or smoke marijuana, or run a business out of his home, or any number of things. Yet this is exactly what our government constantly does. It’s so sad really. I have had it up to here, I’m fed up, as connor is, I’m furious! I just wish I could wake up enough others to get the bozos out of office. I’m more angry at my fellow americans who are sheep than I am at the government! Though I reserve plenty of indignation for them as well. Sigh, I’m done ranting. Well, anyway, public education is critical to protecting our way of life and our form of government. We’ve got to preserve our “democracy”, duh. Good thing our politicians are smart enough to bail us out when things get rough so we keep our capitalism alive and all that stuff! Thank goodness I learnt civics in my public school or I’d be dumb by now. Connor, I agree 100% with you. The GOP has thrown in the towel and they have turned the Federal government over to the Dems for at least the next 8 years. The GOP abandoned the Reagan Plan and went the easy route. I no longer consider myself a Republican. I didnt leave the Republican party, they left me. Nice post Connor. You covered all the bases. But has there ever been a time when two principled parties clashed in a fight of ideals free from corruption? We have an ideal to strive for and have noticed a measurable decline in the last few decades, but it would be depressing (and unrealistic) to hold ourselves to a time that never existed. Washington was there shooting people at Shays’ Rebellion with the other bureacrats. Mr Steele is the guest host on Bill Bennett’s ‘Morning in America’ radio show today. He had on a guest…..his hero, the honorable and magnificent, Rudy Giuliani. UGH. Ron Paul Republicans allowed? Hmmm, I don’t think so. The GOP just doesn’t get it. A large military, intervening around the world, IS big government. The love and worship of all things military is disgusting. Has there ever been a country that has had a big gov’t foreign policy and a limited gov’t domestic policy? Over time it is impossible, as we are seeing in our own country today.